What a marvellously biblical statement by the senior Western Arnhemland artist, John Mawurndjul. He made it boldly in accepting this year's prestigious male Red Ochre Award at the Sydney Opera House in May. 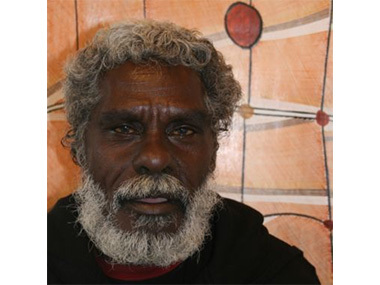 And the once-shaggy bushman, who lives 50 km from the township of Maningrida on his own Milmilngkan outstation, hunting, caring for his Country and painting, had a new confidence in his hand-in-pocket stance, neatly trimmed hair and beard. Perhaps the changes were in response to this important recognition by his peers. But the biblical quote is also the title of his second institutional solo show – the first was at the Museum Tinguely in Basel in 2005 – at the Museum of Contemporary Art in Sydney. This is co-curated with the Art Gallery of South Australia, and after Adelaide, a slightly reduced version of the 165-work show will tour Australia until the end of 2020. It's also co-curated with the artist himself. 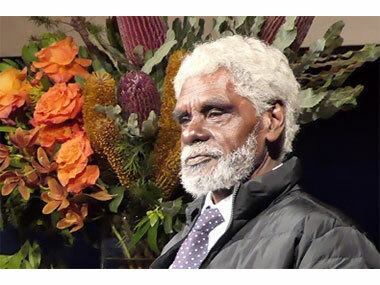 Having witnessed his magnificent 2005 speech – entirely in his native Kunwinjku, though it seemed completely comprehensible – when he was announced as one of the eight Aboriginal artists to decorate the new Musee du Quai Branly in Paris, I'd have no doubts about his capacity to do almost anything he set his mind to. But MCA curator, Clothilde Bullen confirmed his keenness in the curation process: “He's just so charismatic and knew precisely which of his babies were important and which less important. 'This one such a good one', he'd announce. And our exhibition will be fully bilingual, thanks to the heroic efforts of translator, Murray Garde. “We'll be looking at 35 years of Mawurndjul's practice”, Bullen continued; “noting the shifts across that time. He studied the ancients like Yirawala and Midjawmidjaw but was taught to paint by his uncle Peter Marralwanga and elder brother Jimmy Njiminjuma. His early works – seen in the landmark 'Magiciens de la Terre exhibition in Paris in 1989 – were mainly figurative representations of mythic figures like female Yawkyawk water-hole spirits or Mawarrmulmul,the shooting star spirit. Then he carved sculptural figures and lorrkons, adding the finest lines of cross-hatching for the first time in Kunwinjku art”. “I changed the law myself”, this master of the finest of rarrking once boasted. “Finally”, concludes Bullen,”as his knowledge of ceremonial matters grew, he's concentrated on the Mardayin ceremonies that are the foundation of Kuninjku law and culture. These works appear abstract to us because he can only show the public aspects of the ceremony”. But John Mawurndjal himself points out that there are 'inside' matters too for initiates: “The dangarrk lights in the water give off a blue colour at night in the waterholes at Mardayin sites. This is Mardayin – the glowing of the lights is the spirit essence of the ceremony. I saw these lights glowing at night. I put the experience in my head and went and collected bark, scraped it down, and then painted the same thing I had seen in cross-hatched form”. Former Art Gallery of NSW curator, Hetti Perkins described the process as “a kind of alchemy. The essence of the original is there in the new – which shines and glows.” John Mawurndjul, delightfully, amplified in an interview with his long-time art centre manager, Apolline Kohen: “Through some sort of magic, I am a chemist man myself. I am the Number One chemist man”. He is also the senior djunkay or ceremonial manager for the Mardayin ceremony – which is rarely performed these days. He is keeping it alive through his art. It's not all been plain sailing, though, for this great artist. In 1998, his creations were rejected at the Koln Art Fair as “folk art” - which must have made his 2003 victory in Australia's Clemenger (non-Indigenous) Contemporary Art Prize all the more satisfying. And Melbourne Professor Jon Altman, who has spent much time in Kuninjku Country with Mawurndjul, believes that the artist has “quite consciously scrambled the generations of rock art in his Country to find an aesthetic that pleases the Western eye”. Not that this helped when both the Global Financial Crisis and the Intervention struck. The GFC cut sales from Indigenous art centres nationally by 50% between 2008 and '11. And then there were the brutal effects of the Intervention – which replaced the historically competent management of Maningrida's Bawinanga Aboriginal Corporation, which owns the Art Centre, with people so inexperienced that funds were denied it to post art out of Arnhemland. Meanwhile, the Community Development Employment Program which gave art centre and out-station workers a basic income was “demonised and demolished” according to Altman. And a dispirited Mawurndjul, ceasing to have an art income, ceased to paint. He could no longer afford the vehicles necessary to access his outstation, moved into a Maningrida town camp and looked for a job as a tyre-repairer! He was also forced to take the demeaning Basics card limiting this internationally recognised super-star in what he could spend his money on. In Sydney in 2015, he admitted that he'd “taken a break” from bark painting, and “it may be some time before I go back to it”. Fortunately, he has – winning the 2016 Best Bark in the NATSIAAs and completing major commissions for both the MCA and AGSA. Mind you, the now-66-year-old Johnny Mawurndjul did tell the Red Ochre audience that his visit to open the MCA show on 6th July “may be the last time I leave my Kuninjku Country”. The artist in front of one of his Maradyin Ceremony paintings on bark. 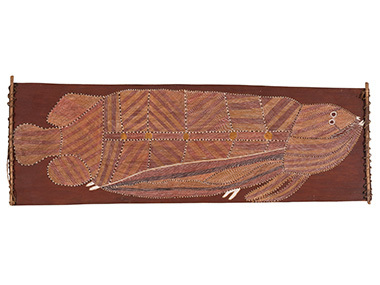 'Fish' (1982) painted at the Mumeka outstation where John Mawurndjul formerly lived.